Dragon Sand Timer | BUDK.com - Knives & Swords At The Lowest Prices! Four ancient gothic dragons guard the sand of time. The real sand and intricate details make this poly resin decor stand out. 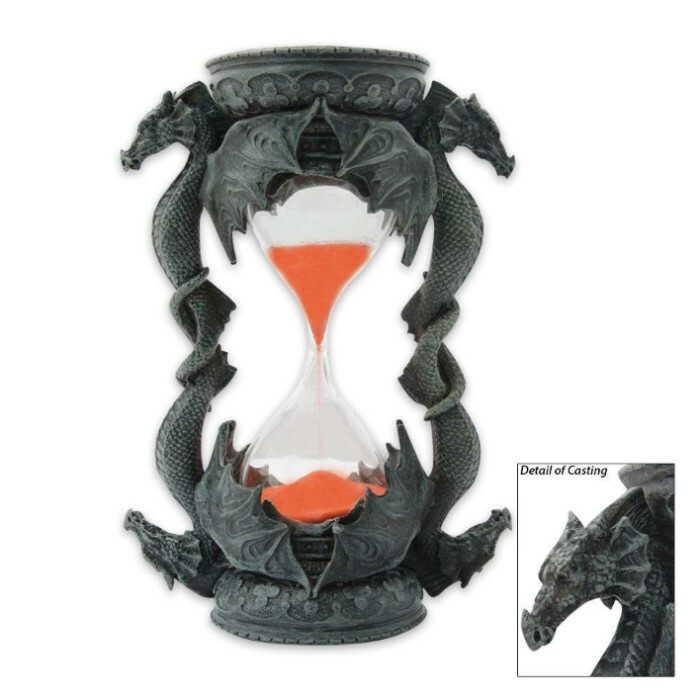 I love my dragon sand timer, it matches my home dÃ©cor just great. It's red sand takes 5 minutes to run through & well in my hour glass collection! I know I saw another that will make a close pair , it has a dragons head only, so it will be coming soon. I love dragons, skulls, & spiders. I'm going to order trinket box right now! The good price got the attention to the ad, and we were not disappointed when it arrived. The size is perfect (see ad, good description) the colors blend well and the glass appears hand-blown, so allow for character-individual details. Seems to time-out in about 5 minutes. Very cute and decorative little hour-glass (with red sand). It reminds me of "The Wizard of Oz" and runs for about 4m 50s. The glass workmanship is very nice. The packaging is quite decorative, as for a gift to a Dragon-Lover.